We know how important money is, and how much of an impact financial situations can play in your studies. That’s why at The Sheffield Collge we will always do our best to support you through your time at college. The Sheffield College's Student Support Fund helps students on a low income to overcome financial barriers, enabling them to continue with and successfully complete their education. You may be eligible for help with the basic (but important!) necessities of undertaking a course at The Sheffield College, including getting to and from college, having the correct/essential books and equipment for each course, and with free college meals. Eligibility is determined by the current annual net household income of the student and partner or parents/guardians living at the same address. All applications are considered individually, but if the annual household income is above £30,000 awards will only be made in exceptional circumstances. Please note, travel support will not be paid to students who hold an English National Concession Pass or Mobility Pass that entitles them to free travel on public transport. All applicants to the Student Support Fund must provide appropriate recent evidence of their eligibility. Initial assessment of applications and all support payments are conditional on the student’s adherence to The Sheffield College’s ABC rules – Attendance, Behaviour and Completion of work throughout the year. Support will be stopped completely if attendance falls below 85%. In these circumstances the Financial Support Team will require written explanation of mitigating circumstances and approval for assessment or further payments from the student’s Tutorial Mentor. To access the Learner Support Fund you must be under the age of 19 on 31st August 2018; for the Adult Student Support Fund you must be aged 19 or older on 31st August 2018. All applicants must be enrolled on an eligible course at The Sheffield College. 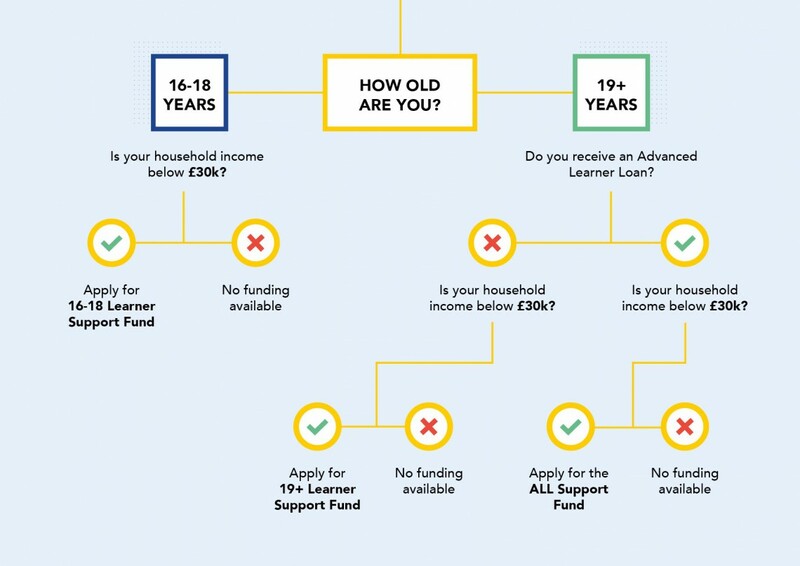 Students aged 19 or over who have successfully applied for an Advanced Learner Loan can apply for support from the Advanced Learner Loan Bursary Fund. A copy of the letter from Student Finance England confirming approval of the Advanced Learner Loan is required as evidence. Otherwise all eligibility conditions, supporting evidence requirements, payments and allocations are the same as for other 19+ students. Once your application has been received and processed, you will be informed of the outcome of your application by letter. Due to the high volume of applications received it can sometimes take several weeks to receive a decision, however applications will be backdated and any payments will be made to you ASAP. If you have further questions, please read our Student Support Fund FAQs which answers questions such as when payments will be made, how Free College Meals work and what the best travel options are. Alternatively, you can hand in your completed form to Student Services at your nearest college campus.